Fulminant type 1 diabetes is temporarily categorized as idiopathic type 1 diabetes mellitus (type 1B). It is characterized by an abrupt onset of the disease mostly with ketosis and ketoacidosis, accompanied by severe metabolic disorder, remarkably elevated blood glucose concentration, and almost complete, irreversible loss of islet function. In severe cases, the disease causes serious complications such as rhabdomyolysis, acute renal failure, and cerebral edema. Fulminant type 1 diabetes most commonly occurs in Asian countries. Timely diagnosis and treatment are the keys to improve the prognosis of patients. 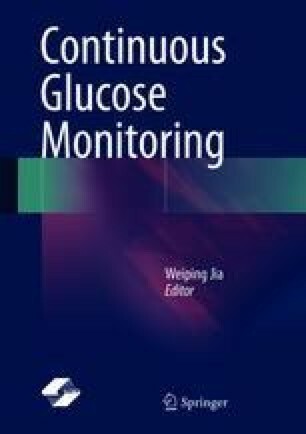 As a novel glucose monitoring technology, continuous glucose monitoring (CGM) is helpful to optimize the treatment regimen. This chapter will first briefly introduce fulminant type 1 diabetes with regard to the basic concept, diagnostic criteria, epidemiology, pathogenesis, clinical features, treatment, and prognosis. Also, we will continue to explain how CGM can be used to analyze the characteristics of blood glucose variability in fulminant type 1 diabetes and to guide the adjustment of individualized treatment through the presentation and analysis of typical cases.